Two two teams have taken a very different path yet find themselves in the same spot – just 90 minutes away from their first A-League Championship. For Adelaide it could cap off the most remarkable turn around we have seen in the A-League. They opened the season with 5 losses and 3 draws to be sitting bottom of the ladder. The Wanderers on the other hand were quick out of the blocks with a stretch of seven consecutive wins sending them to the top. A dip in form saw them relinquish the Premier’s Plate but they have again shown that they are nearly unbeatable at Wanderland. Adelaide progressed to the Final on the back of a 4-1 win over Melbourne City. After a slow start the match came to like early in the second half with a Bruce Djite double. City would peg back a goal but once they went in search of an equaliser they left themselves exposed and got punished as Adelaide would find the net two more times. 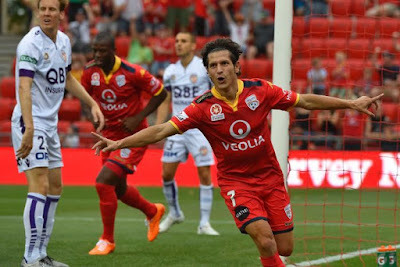 Then we have what happened at Wanderland… Brisbane got off to a dominant start and were up 3-0 by the 23rd minute. they were on track to make the 4th Grand Finals in 6 years but the Wanderers had other plans. Goals from Casterlen and Santalab has them just one down at the break before Casterlen struck two more times before the hour mark to grab his hat-trick and give his side the lead. The Roar leveled things to force extra time but there was only ever going to be one winner. A Vidosic goal sent the crowd at Pirtek into pandemonium but getting back up for the Grand Final will not be easy. Adelaide will have two additional days rest before the big one and it shapes as a significant advantage. The Wanderers had to play extra time and have had to travel. The full week is more than enough but following the emotion of the match against Brisbane will have stayed with them for at least a few days. There will also be a notable absentee for Western Sydney – 20,000 screaming fans at Wanderland. One should not underestimate the significance of the crowd at Pirtek and the Wolf says without it there is no way they would have been able to overcome the 3-0 deficit last week. Western Sydney simply cannot afford to go down by a goal early. Adelaide have been superb defensively with 6 clean sheets in their last 9 following some key defensing changes from Guillermo Amor. La Rocca, Marrone and McGowan have been excellent while in the middle third Carrusca, Isaias and Cirio have been dominant. Similarly the Wanderers have been relying on their trio of imports with Alberto, Dimas and Andreu not to mention hat-trick hero Casterlen. Mitch Nichols, Bridge and Santalab round out their attack but despite scoring 5 goals last week the Wolf insists that Adelaide are the more dynamic side of the two. Adelaide are undefeated in their last four at home to the Wanderers with 3 wins and a draw. The shift from Coopers Stadium to Adelaide Oval isn’t ideal for the Reds but the venue now has a capacity of 53,500 and that makes for a cracking atmosphere. Four of the last five Grand Finals have had at least 3 goals and after the scoring clinics both teams put on last week we could see yet another explosion of goals. Adelaide to be crowned A-League champions for the first time following a 2-1 win.